For the 2010 season, Team Evotri announced a new partnership with Specialized Bicycles. Specialized has long been a major player in the road and mountain bike markets, but it wasn’t until the 2008 introduction of the carbon Transition that they made serious inroads into the booming triathlon market. I am planning a two-part review here. This initial review will just focus on the Specialized frame and I will follow that up with a review of the wheels and components. Given that Specialized is a team sponsor the savvy reader probably expects nothing short of a glowing review which concludes with “buying this frame will cut a half hour off your Ironman bike split!” I built up my own frame as well as my teammate Stu’s, so I have a good working knowledge of how these frames are built and how well everything works together. As I have done in the past I won’t hold back any punches in these reviews. I will tell you what I like and what I don’t like. More than that, I will tell Specialized and the other sponsors what works and what doesn’t in the hopes that this feedback will result in even better products down the line. There are actually 7 variations of the Transition currently available from Specialized. The bottom of the heap is an aluminum frame with low-end components. The top-of-the-line S-Works carbon frame and all the gee-whiz components is about 5 times the price of the entry model. Most of the EvoTri team is on the Transition Pro frame, which is a small step down from the S-Works. The first thing that confuses me about this line-up is that Specialized doesn’t really differentiate between the S-Works and the Transition Pro. The S-Works uses a higher quality carbon that is supposedly lighter and stiffer. From a consumer standpoint, if you want customers to buy your top-of-the-line frame I would try to quantify these differences. Is an S-Works frame 100 grams lighter? 10% stiffer? Why should I ante up $1300 more for the S-Works frame? You do get a really nice looking Specialized integrated BB30 crankset with the S-Works, which is a good chunk of the cost difference. As I see it, the real value in the Specialized lineup is the variations of the carbon Transition frame: the Comp, Expert and Pro. 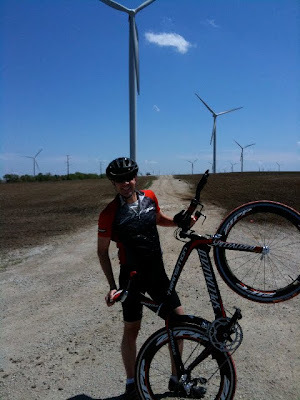 If you are a beginner, the $1450 Aluminum Transition A1 Elite is also going to be hard to beat. Let’s dissect the Transition Pro frameset a bit. The frame is built with FACT 7 carbon (a small step down from the FACT 9 used by the S-Works). 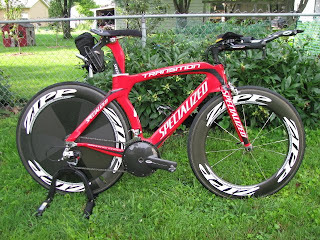 I didn’t weigh it, but I found another review claiming a weight of 1690 grams, which is tolerable –but certainly not industry leading- for an aero tri frame. The frame has all the standards that you would expect from a triathlon frame in this price point: aero tubing, horizontal dropouts, aero seatpost. So how does the Transition differentiate itself from the competition? In quite a few ways as it turns out. First off, the aerodynamic tube shapes don’t conform to the industry-standard NACA profiles which were designed for aircraft, not bikes. 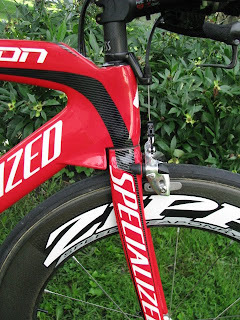 Specialized designed more blunt tube shapes that they claim are better suited to the lower speeds of cycling. 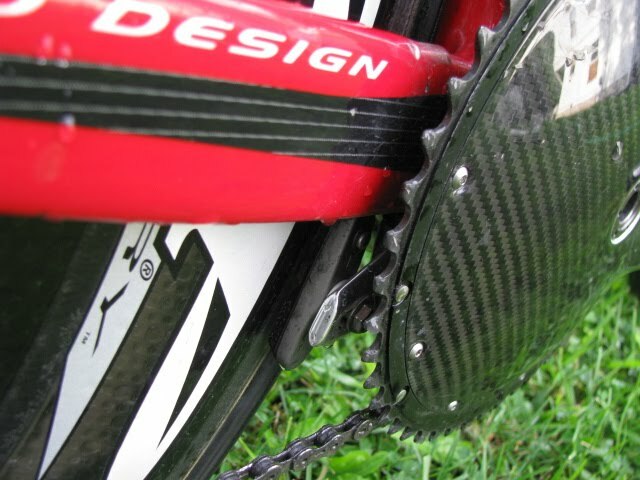 Another striking visual element is the sharp inward bend of the chain stays and seat stays near the rear wheel. 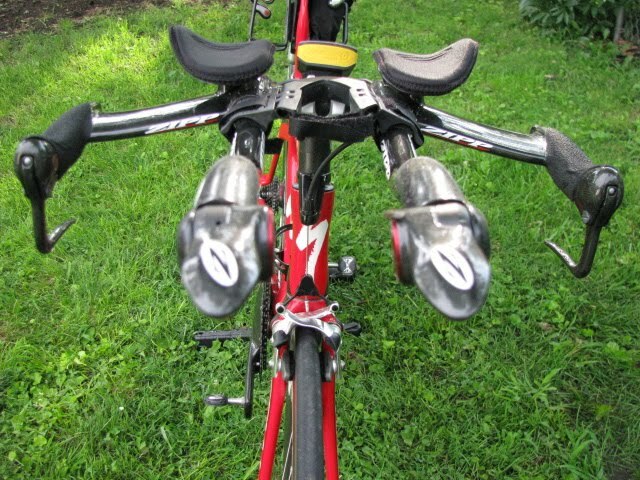 This is another aerodynamic tweak that I have heard some people have had clearance problems with. It hasn’t been a problem with the wheelsets that I have tried so far. 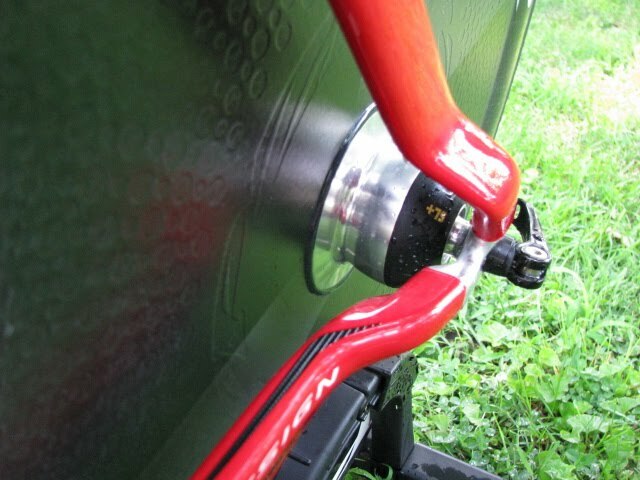 The second more noticeable feature is the integrated brakes which are included with the frame. Both brakes are a custom center-pull design. 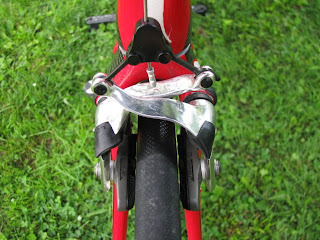 This is primarily done for aerodynamic reasons up front- the cable sits directly in front of the head tube, rather than hanging out to the side. For the rear brake this design serves both functional and aerodynamic purposes. The centerpull design allows the somewhat unique rear brake mounting beneath the bottom bracket. 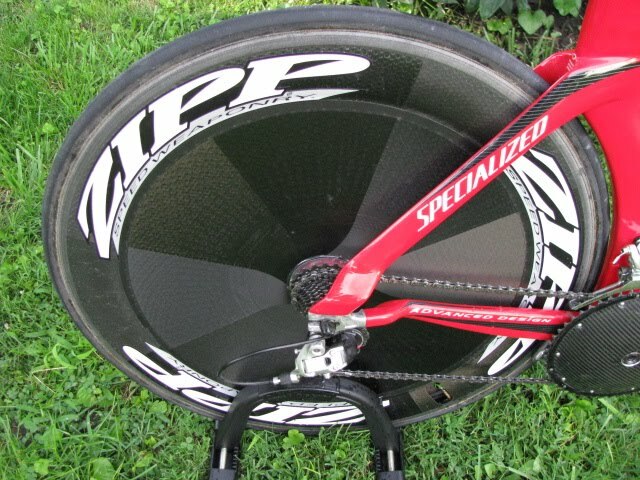 This keeps the brake out of the wind and improves aerodynamics. As someone who grew up riding mountain bikes before V-brakes existed and way before disc brakes, the cantilever system is quite familiar. For the average rider the system may be unnecessarily complicated. There are two very tiny pinch bolts that hold the cable in place. These seem to do a fine job, but I would like to see them built to a heavier spec. There is a general trend among bike manufacturers towards proprietary parts that I am not a huge fan of. For those of us who travel often to important races a common scenario is that the airline somehow manages to damage your well-packed frame, or something winds up missing. If it is a proprietary part that gets damaged or goes missing, like a brake or seatpost clamp, the local bike shop might not have any repair parts in stock. Proprietary parts also limit component choice. Your current brake options for the Transition are the stock brakes and that is it. To be clear, there is nothing wrong with the performance of the brakes. Set-up correctly they feel almost as solid as a Dura Ace or SRAM Red brakeset. One of my biggest pet peeves about the frame is adjusting the rear brake. 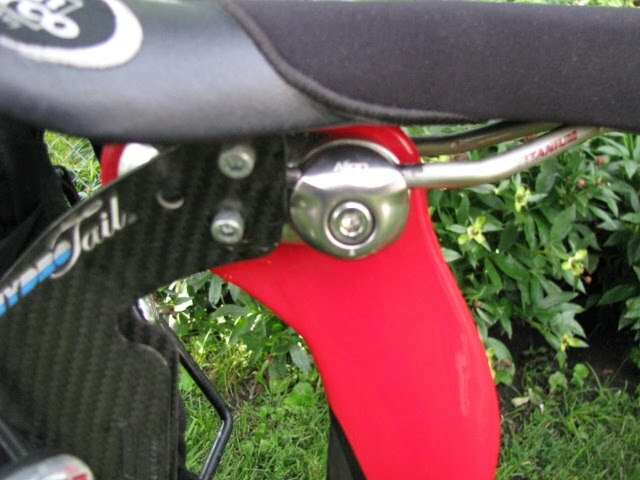 Specialized realized that access to the brake was going to be difficult, so they include a nut on the drive-side brake pad so that it can be adjusted with a wrench instead of an allen wrench. What cannot be easily accessed though, is the spring tension screw used to center the brake pads. With most cranks, you need to remove the entire crank to get to the tiny screw. I may be able to make a really short allen wrench, but this is one adjustment that you want to get right the first time. Next up is cable routing. I’ve built or rebuilt 4 tri bikes in the last few weeks and manufacturers could certainly stand to think a little more about cable routing. On the Transition the rear brake cable and two derailleur cables all enter the frame directly behind the stem. Internal cabling is standard these days, but how it is achieved differs greatly. 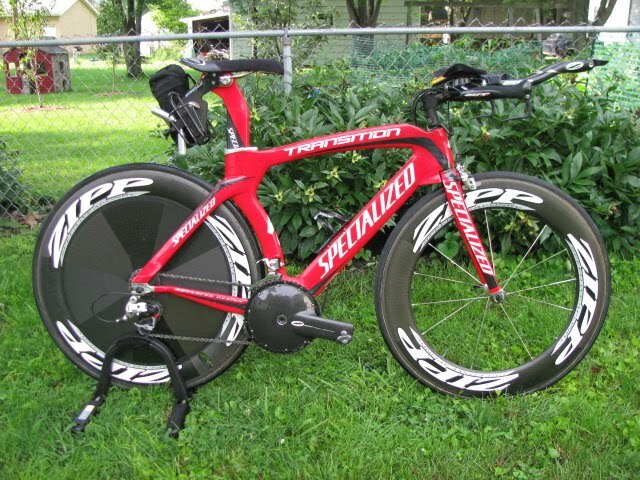 At first, I thought the system on the Specialized would be a real pain to set up and then would bind when used. In reality the three cables entering behind the stem is not only aero, but it does not bind at all when you turn the bars- a pleasant surprise! Getting cable housing lengths correct was a real PIA, though. Rather than using cable stops, the housing runs all the way through the frame. This actually adds a somewhat significant amount of weight and complicates the building process a little. Specialized included a 4th hole for running a cable to an SRM Power Meter. Since everything is going wireless, this is somewhat obsolete. I filled the hole with silicone since I end up racing in the rain way more often than I would like. 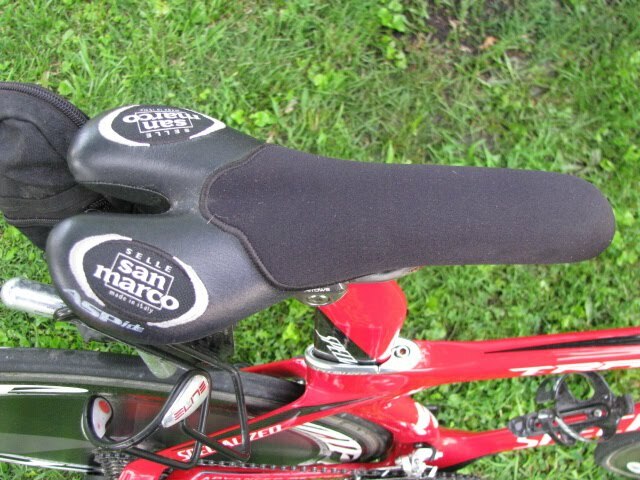 The seatpost features a two-position head, allowing for a variety of positions. 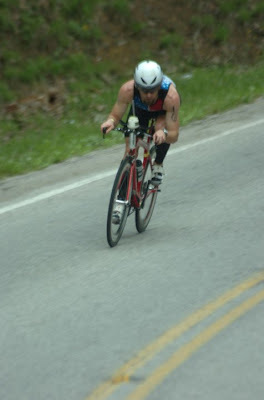 I am a firm believer that tri bikes should be ridden steep for most competitive riders, so I use the forward position. 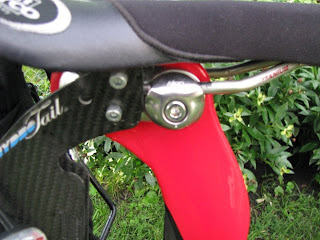 The seatpost is held in place by another proprietary wedge-style clamp. Every manufacturer has a different take on the aero seatpost clamp. 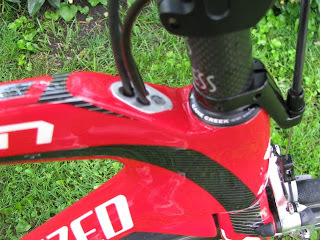 Specialized’s design seems to hold things in place without stressing the frame. One thing to note about the Transition Pro is that it is an aggressive frame that is meant to be raced. 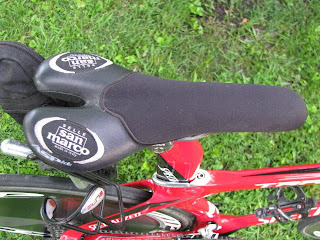 Given the amount of drop from the saddle to the handlebars a really relaxed, upright position is not possible. 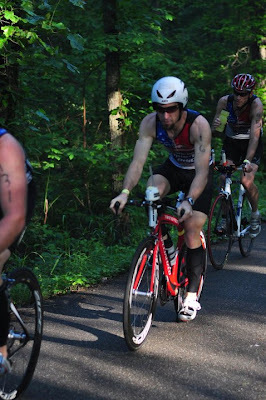 A comfortable long-course position with a reasonable amount of drop is not a problem. I set this bike up to almost exactly the same fit specs as my previous frame. This attention to detail allowed me to feel at home right away on the new frame. You feel like you are sitting up higher on this bike because of the sloping top tube that is found on all frames utilizing compact geometry. If the frame is stiff enough for Fabian Cancellara (he won a Tour of California TT on this frame) it is surely stiff enough for me. Handling is predictable and not twitchy (for a tri bike anyway). The bike really shines when you step on the pedals- I feel like there is no wasted energy, everything I put into the pedals translates into forward momentum. For such a stiff frame, the ride quality is also better than I expected. The carbon does a nice job of damping road vibrations. Since finishing the bike build, I won the elite wave of a local tri and have gone 4 for 4 on overall wins at our local Tuesday Night Time Trial series. So it is fair to say that aside from the few design tweaks and peeves mentioned above, I am digging this new ride and looking forward to throwing down some fast bike splits the rest of the season! Stay tuned for a detailed review of all the fancy bits and pieces on my Transition Pro. Up the mountain at Triple-T! Down the mountain at Triple-T!